Whether it be coal-seam gas, LNG or coal mega-mines, a resources rush is happening in just about every productive corner of our country. Yet at the same time oversight and regulation have been hollowed out. Todd Stern, the U.S. Special Envoy for Climate Change, was in my neck of the woods the other day. Speaking at Dartmouth College, an hour's drive from where I'm spending a quiet vacation with my family, he said something so disturbing that I was compelled to dust the beach sand off my feet and respond. Since pretty much the start of the National Electricity Market more than a decade ago, the Australian power industry has regarded the annual Electricity Statement of Opportunities as their bible to help pinpoint where a new coal or gas-fired generator might be needed to meet rising demand. The built and natural environments are now changing so rapidly that our language and conceptual frameworks have to work overtime just to keep up. Few international figures have been as consistent in warning about the threat posed by global warming as economist Fatih Birol, of the International Energy Agency. In an interview with Yale Environment 360, Birol explains why the situation is worsening and what needs to be done to significantly slow emissions. In 118 years of U.S. records, July 2012 stands as king, hotter than any month previously observed. NOAA reports today that the average temperature across the continental U.S. was 3.3 degrees Fahrenheit warmer than the 20th century average, 0.2 degrees hotter than the previous record set in July, 1936. Stockpiles of the biggest crops will decline for a third year as drought parches fields across three continents, raising food-import costs already forecast by the United Nations to reach a near-record $USUS1.24 trillion. Attribution of extreme events shortly after their occurrence stretches the current state-of-theart of climate change assessment. To help foster the growth of this science, this article illustrates some approaches to answering questions about the role of human factors, and the relative role of different natural factors, for six specific extreme weather or climate events of 2011. Advocates for action to address climate change are making messaging hay out of this year's seemingly endless procession of storms, droughts, heat and wildfires. The first scientist to alert Americans to the prospect that human-caused climate change and global warming was already upon us was NASA climatologist James Hansen. In a sweltering US Senate hall during the hot, dry summer of 1988, Hansen announced "it is time to stop waffling... The evidence is pretty strong that the [human-amplified] greenhouse effect is here." Farmers and environmental activists in NSW and Queensland have joined forces at the border in a marathon protest against the expansion of coal seam gas (CSG) mining. If Victorian Premier Ted Baillieu came to power with a determination to kill off opportunities for wind farm development in Victoria, then he can be proud of his work. Last Friday, the Victorian and federal governments announced a $90 million fund to develop brown coal processing technology in the Latrobe Valley. The fund is called the Advanced Lignite Demonstration Program (ALDP) and, according to the brochure, its main goal is the “development of low-emission coal products for export”. Over the last few months, I have had the pleasure of presenting to hundreds of solar industry delegates at the EcoGeneration Master Classes held around Australia. Inevitably, the most interesting part for me was the conversations with so many who are at the ‘coal face’; working day in, day out to sell the virtues of solar photovoltaic (PV) against rising coal-fired energy prices. Australia has long been regarded as one of the pioneers of the global solar photovoltaic industry, courtesy of its excellent research at institutions such as UNSW and elsewhere. Now, thanks to its excellent solar resource, rising electricity costs and the falling cost of solar PV, it is now emerging as the leading market for rooftop solar as well. According to the Western Australian government’s own economic assessment, the Browse LNG precinct proposed for James Price Point is likely to have a significant adverse impact on the state’s budget, will employ few local workers and harm the region’s reputation as a tourist destination, a new analysis by The Australia Institute has found. When it comes to the future of wind power, one company thinks it looks a lot different than you would expect, and cheaper and more efficient to boot. As climate change accelerates, it appears the Obama administration is in retreat. In an address on Thursday, the top climate negotiator for the United States rejected the administration’s formal commitment to keeping global warming less than two degrees Celsius (3.6°F) above pre-industrial levels. A private index shows the carbon tax had little effect on inflation in its first month of operation, despite pushing up energy costs. There is at least one conspiracy theory which Andrew Bolt isn't happy to endorse. Up until last week, Bolt was listed as an adviser to one of Australia's most active climate denialist organisations the Galileo Movement. But then what happened? Today, Greenpeace released a briefing detailing Romney campaign operative and Press Secretary Andrea Saul’s involvement with DCI Group, a firm that was on contract to ExxonMobil at the height of the oil company’s campaign to attack global warming science and climate change policy. The Berkeley Earth Surface Temperature (BEST) study recently found that global land-surface temperatures have increased by about 1°C since the 1950s — and 1.5°C since the mid-18th century. July saw 3,135 new daily high temperature records in the U.S. — over 100 per day. 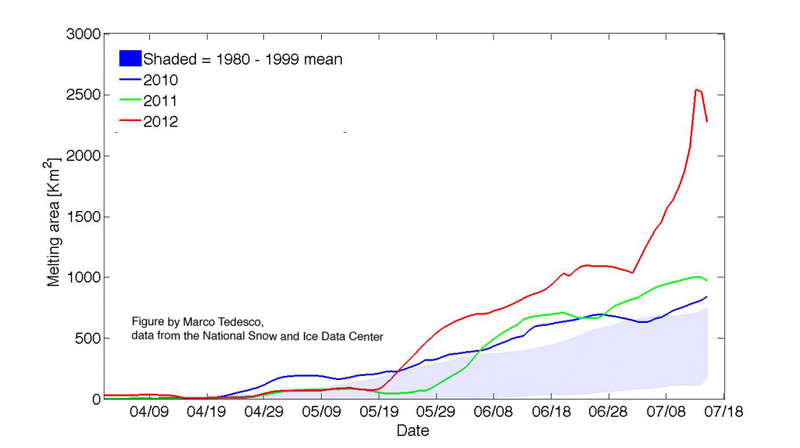 That overwhelmed new cold records by a factor of nearly 17 to 1, as this chart from Capital Climate shows. 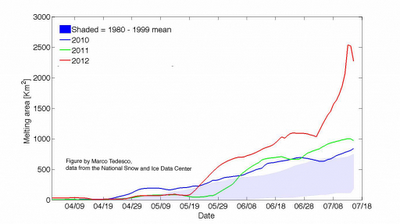 Much to-do has been made this week about surface melt in Greenland. For anyone who hasn't been following the story, NASA released findings that shows surface melt has been observed on more than 97 percent of the Greenland ice sheet this summer a rate unprecedented in the era of satellite observation. An international research team led by the University of Colorado Boulder and the University of Helsinki has discovered a surprising new chemical compound in Earth's atmosphere that reacts with sulfur dioxide to form sulfuric acid, which is known to have significant impacts on climate and health. Looking for ties between higher temperatures and heart failure, researchers find a troubling pathway.